This book offers a major reevaluation of one of art history's most popular and important art movements. 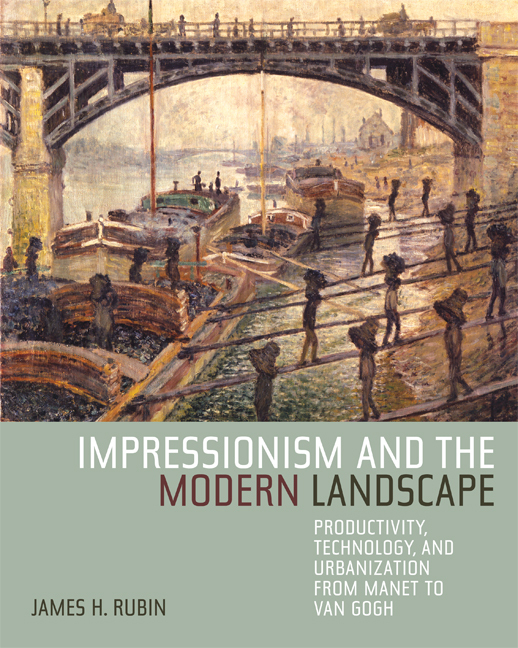 In Impressionism and the Modern Landscape, James Rubin shifts the focus from familiar scenes of pleasure—the beautiful countryside, people at leisure—to a landscape changing as the result of productivity, technology, and urbanization. He demonstrates not only that the industrial and demographic revolutions of the nineteenth century had a profound impact on art, but also that impressionism was the first art historical movement to embrace such changes. Looking principally at Claude Monet, Camille Pissarro, Alfred Sisley, Armand Guillaumin, and Gustave Caillebotte, Rubin has selected works in four categories: industrial waterways, trains, factories, and photographic viewpoints in the modern city. The examples convey not only these major themes but also the painters' belief in the progress of civilization through science and industry. The book thus expands the scope of impressionist celebrations of modernity to include "impressionism's other landscape." James Rubin is Professor of Art History at Stony Brook, the State University of New York, and Adjunct Professor of Art History at the Cooper Union. He is the author of eight books, including Courbet, Impressionism, and Impressionist Cats and Dogs: Pets in the Painting of Modern Life.